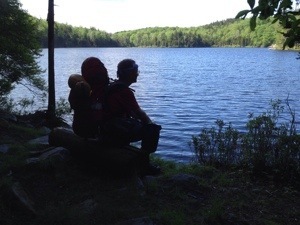 Clarendon Shelter, Vt. AT NOBO mile 1680.6, June 4, 2014 — It was the best of hikes and the worst of hikes albeit in reverse order. 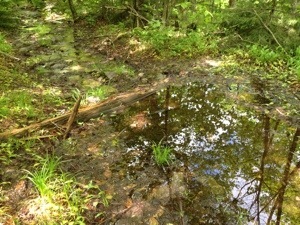 After last night’s thunderstorm deluge the hiking was no surprise this morning. 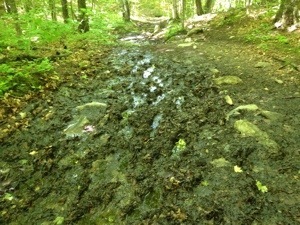 I’ve always complained that the trail in Vermont was more like hiking in a dry river bed. Well, today they turned into real rivers. 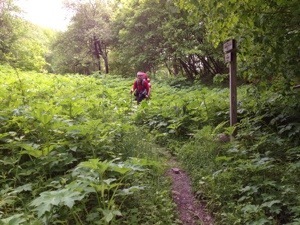 The torrents raging down the trail could have been on a movie set. Oh yah, we also found Vermud too. The viscous goo was ubiquitous, black, juicy and about as sucky as it could be. Stick in a trekking pole and you’d just as likely lose the rubber tip in the ooze as any thing else. That was all this morning. Our fortunes reversed when we crossed Vt. 140 at mile 1,673.3. 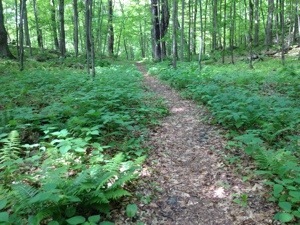 The trail conditions shifted radically on the climb out. It appeared that far less rain had fallen on that side of the mountain. The trail was mostly dry and the going quick. What a flip! We were able to double our pace. That was the best of hikes. It was like a new day. The humidity and temperature even dropped to more comfortable levels. Tomorrow we scale 3,920 ft. Killington Peak. If the ski patrol warming hut on the summit is open, we’ll sleep there. Otherwise there’s a shelter not much further down the back slope. Slogging through the muck is not fun. I bet your shoes are a mess. You are making progress. Stay safe.